The occupation outside St Paul’s is a week old and an offshoot has started up in Finsbury Square where there is plenty of room and no pesky priests quoting Health and Safety (!) and ding the bidding of their insurers. I have nothing special to say which others aren’t already saying. Penny Red doing well and also in the New Statesman, and the Occupation web site itself. I went down yesterday and, getting off the bus at Bank, saw a crowd in the triangular plaza in front of the Royal Exchange. It turned out to be a ‘teach-out’ from the Occupation: a great idea. In this one John Christenson from the Tax Justice Network was doing his super-expert stuff on tax havens and avoidance. Had a large crowd gripped. Then along at St Paul’s some very cheery people, stickers, music, argumentation… Good age range, though with a missing middle as usual. 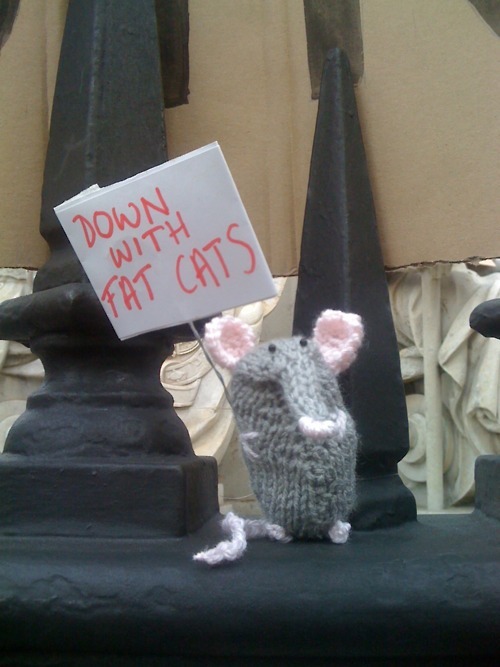 Had a friendly exchange of tweets with a radical knitter ‘Deadlyknitshade’ because I had her mouse on my screen last week and it formed the unintended background for a 0900 class at UCL. 0900 is bad enough, but the Victoria Line was playing up and many of us were late, with no breakfast. As I started stirring the porridge (that’s what the class felt like) I began to see some smiles. Looked round. Saw the picture and explained. It helped.